#53 in an ongoing series of posts celebrating the alphabet. 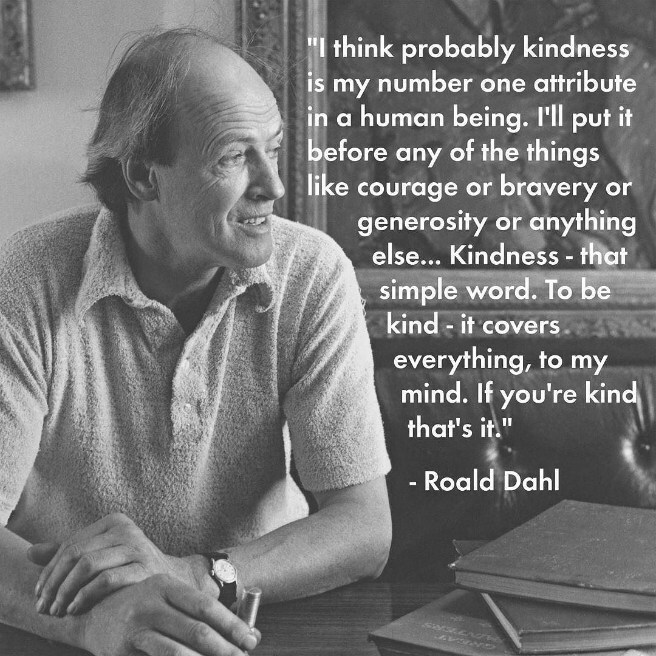 I was actually introduced to Roald Dahl’s writing by one of my high school students in Wimbledon. Danny M. (who made good chocolate chip cookies and scoped out a yummy bagel shop in Queensway) raved about a collection of Dahl’s adult short stories called Kiss Kiss. Though I do not have a taste for the macabre, I found the stories addictive and loved the surprise endings. 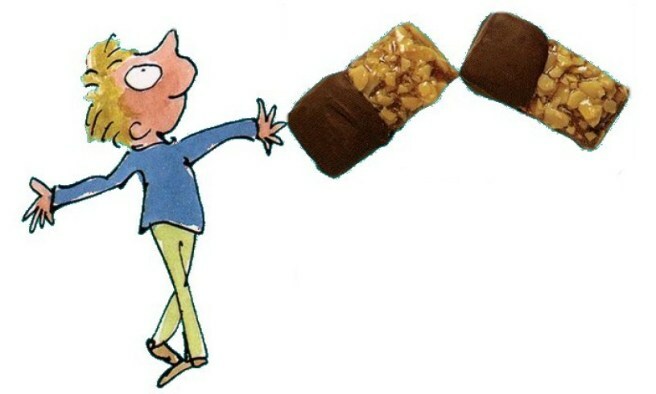 After I read as much of his adult fiction as I could find, I moved on to Dahl’s children’s books, impressed by the eyebrow-raising irreverence and sardonic wit, delighted by the clever, inventive wordplay and generous servings of lickswishy, delumptious treats. He was unlike any author I’d read in my childhood. 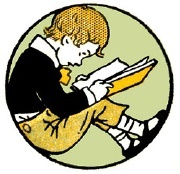 There was nothing Pollyanna or namby pamby about any of his magical stories, and I liked his recurring themes of child empowerment, justice and retribution. He made it okay to be a nonconformist, appealing to the inner rebel in all of us. Whenever I’m asked about my favorite food-related children’s books, the first that comes to mind is Charlie and the Chocolate Factory. 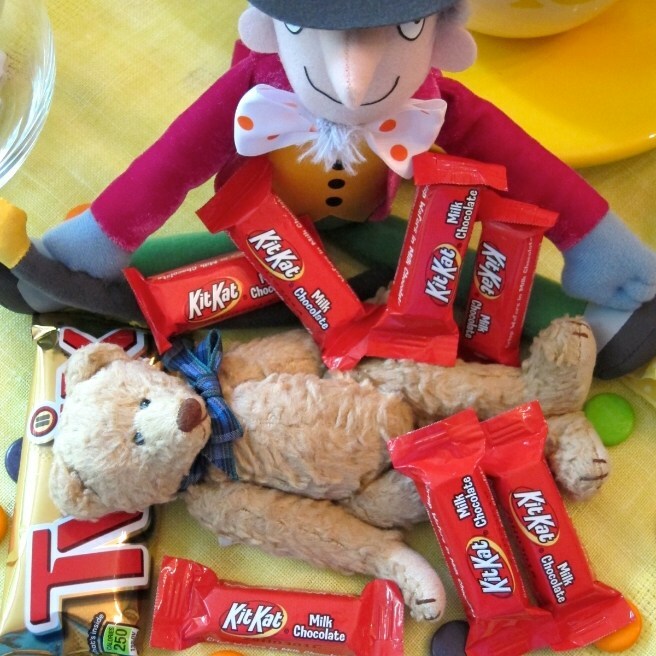 Here was every child’s dream come true — a world where everything was sweet and edible. 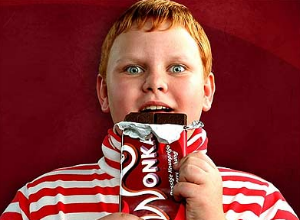 I want my own Oompa-Loompas, and even if Mr. Wonka wouldn’t approve, just once I’d like to drink from his river of hot melted chocolate. To celebrate Dahl’s 100th Birthday, I thought it would be fun to serve up a little Foodie Alphabet (followed by a scrumdiddlyumptious recipe of course). Not only did food play a central role in many of his children’s stories, in real life he was passionate about growing, cooking and eating it. 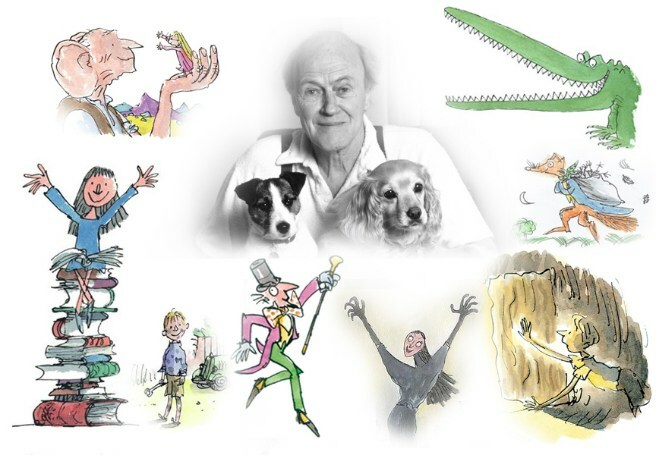 Please put on your best bibs, rake your tongues and enjoy these tasty tidbits from Dahl’s life and books. Grub’s Up! A – APPLE: Roald’s sisters called him ‘The Apple.’ He was the apple of his mother’s eye, the only son of five children. B – BACON: He loved the smell of bacon frying, had his own bacon slicer (to make it paper thin), and sometimes made bacon and marmalade sandwiches as a teatime treat for his children. C – CHOCOLATE (of course! ): Roald was a diehard chocoholic who preferred his chocolate “straight” (as candy bars rather than in chocolate cakes or ice cream, etc.). 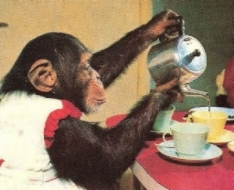 He and his schoolmates sometimes taste tested newly invented chocolate bars for Cadbury. Bonus C: CAVIAR: Dahl’s favorite food. 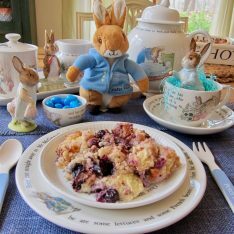 D – DOC SPENCER’S PIE: “Very carefully, I now began to unwrap the greaseproof paper from around the doctor’s present, and when I had finished, I saw before me the most enormous and beautiful pie in the world. 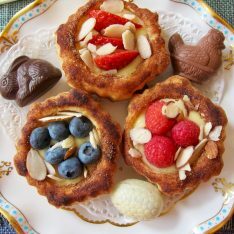 It was covered all over, top, sides, and bottom, with a rich golden pastry” (from Danny and the Champion of the World). 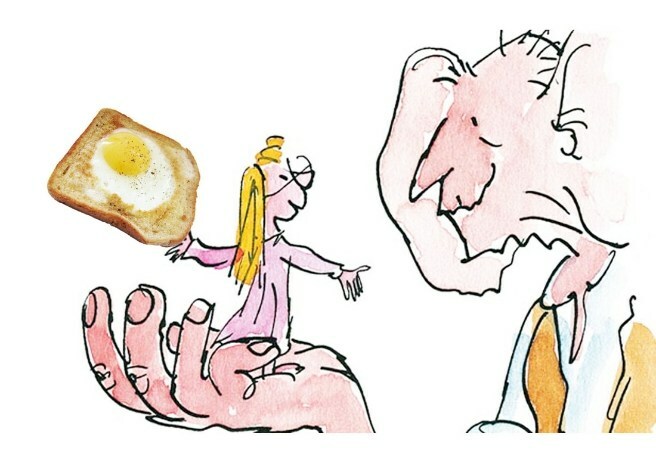 The recipe for Doc Spencer’s Pie, which calls for hard boiled eggs, grated cheese, ham and phyllo dough, can be found in Roald Dahl’s Even More Revolting Recipes. 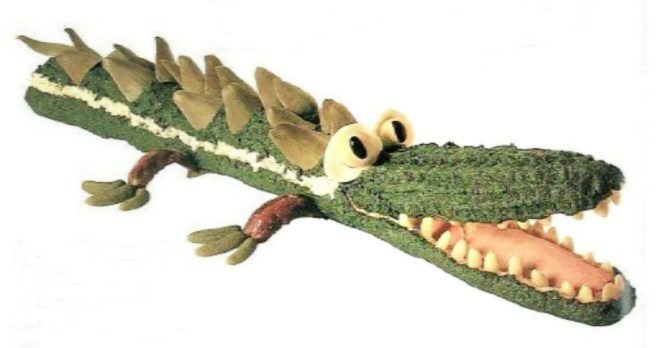 E – ENORMOUS CROCODILE CENTERPIECE: A fun party idea (made with baguette, chopped spinach, artichokes, ham, egg, sausages, cocktail gherkins). Best to eat it before it eats your children. Recipe included in Roald Dahl’s Revolting Recipes. 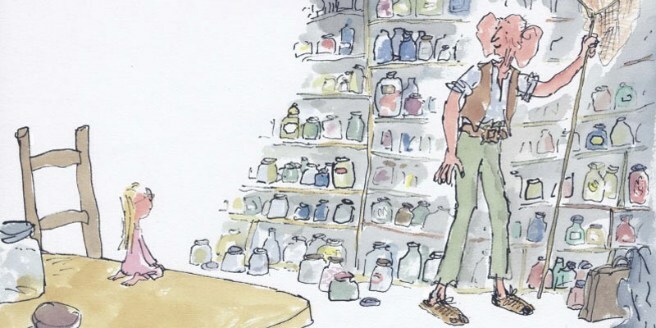 F – FISH: The fishmonger was Roald’s favorite shop. During summer holidays when he was growing up, he and his sisters would row out into the fjord to fish, using mussels as bait. His mother would gently fry the day’s catch in butter and serve it with boiled potatoes. He said, “I have never tasted fish as good.” As an adult, his typical lunch included Norwegian prawns with mayonnaise and lettuce. G – GLUMPTIOUS GLOBGOBBLERS: “To the Giraffe I gave a bag of Glumptious Globgobblers. The Globgobbler is an especially delicious sweet that is made somewhere near Mecca, and the moment you bite into it, all the perfumed juices of Arabia go squirting down your gullet one after the other” (from The Giraffe and the Pelly and Me). There’s a recipe for a savory version of this treat — meatballs made from chicken breasts, arborio rice + spices — in RD’s Even More Revolting Recipes. J – JELLY: One of Roald’s dessert inventions (cake decorating sprinkles added to a batch of Jell-O®). Just in case you crave something crunchy and wibbly-wobbly at the same time (naturally, kids go wild for it). Recipe included in D is for Dahl. K – KAA INDANA KIAZI (Piggy’s Potatoes): When Roald was working for the Shell Company in Dar es Salaam in 1938, he and his roommates had a cook they affectionately called Piggy. One of their favorite dishes, which Piggy made at least twice a week, was Kaa Indana Kiazi, or Crab in Potato. It was a baked potato stuffed with a mixture of crab and béchamel sauce. Dahl described it as “simple and yet so glorious.” A recipe for Piggy’s Potatoes can be found in Memories of Food at Gipsy House. L – LEG OF LAMB: In “Lamb to the Slaughter,” one of Dahl’s adult short stories, a woman kills her husband with a frozen leg of lamb. She effectively “hides” the murder weapon from the police (who are searching her house from top to bottom) by roasting it and serving it to them for dinner. M – MUSHROOMS: Later in life, Roald loved to go mushroom-picking early in the morning with his dog Chopper. His wife Liccy’s recipe for Mushrooms on Toast is included in D is for Dahl. N – NISHNOBBLERS: “There were Nishnobblers and Gumglotters and Blue Bubblers and Sherbet Slurpers and Tongue Rakers, and as well as all this, there was a whole lot of splendid stuff from the great Wonka factory itself” (from The Giraffe and the Pelly and Me). 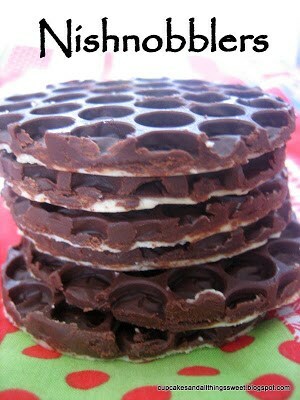 There is a recipe for Nishnobblers (treats made from tempered dark and white chocolate spread over bubble wrap and cut into circles) in RD’s Even More Revolting Recipes. O – ONIONS: Roald’s favorite vegetable. He grew his own giant onions (sometimes 3 lbs. each!) and loved to eat them raw, as onion rings, or in onion soup. 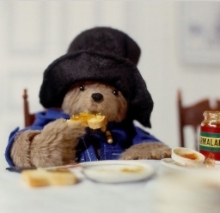 Bonus O: He also loved OXTAIL SOUP and made a good pot himself. P – PEACH: Roald planted a peach tree in his garden at Gipsy House, but it didn’t produce any fruit until the James and the Giant Peach movie premiered in London, when it grew just one perfect peach. The tree then died the following year. Bonus P: POTIONS: He liked to make fun bedtime drinks for his children that he called “witches’ potions” (milk blended with canned peaches with a few drops of food coloring). 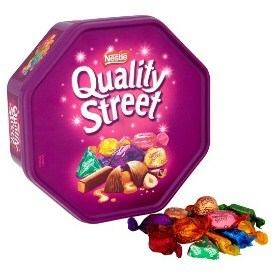 Q – QUALITY STREET: Chocolate toffees first produced in 1937, part of what Dahl calls the Golden Years of Chocolate (1930-37). 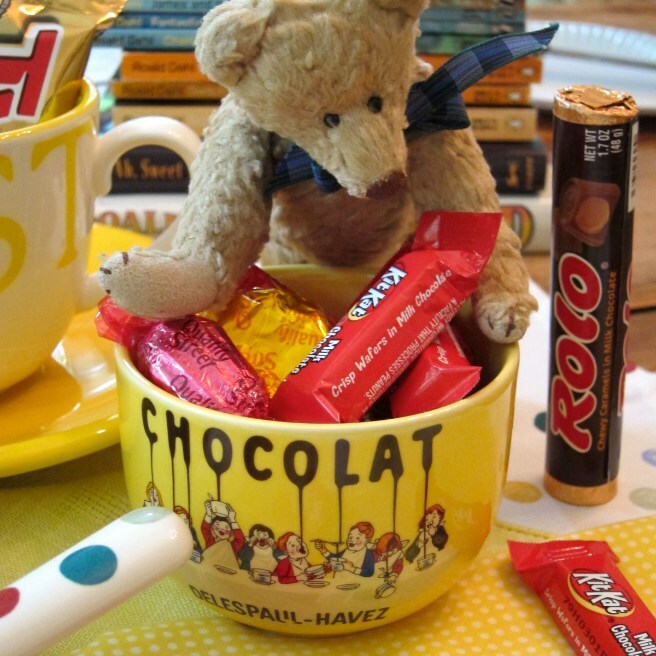 During this “chocolate revolution,” treats such as the Crunchie, Mars Bar, Black Magic Assorted Chocolates, Aero bar, Maltesers, Kit Kat, Rolo and Smarties all came on the market. R – RASPBERRIES: Roald loved growing these when he was young. In Norway, his aunts used to sit with a bowl of yellow “mutter” raspberries and hook out the maggots with needles. S – SAUSAGES: Roald frequently cooked sausages for dinner guests, telling them that only they and the Queen had those particular sausages. 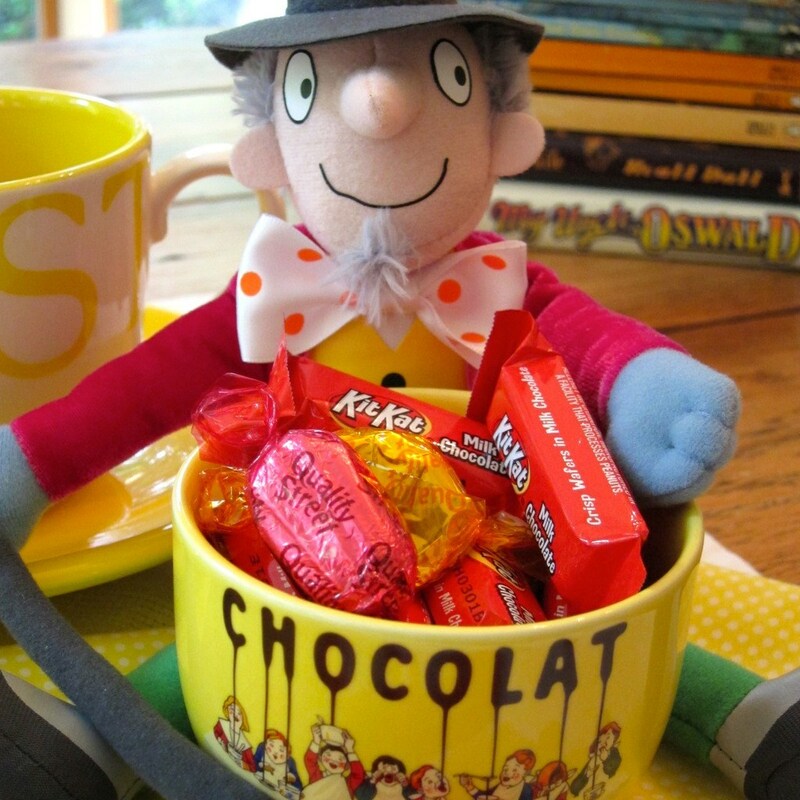 T – TUCK BOX: A small wooden trunk (with padlock) that Roald and each of his fellow boarding school mates had, packed with treats such as cake, biscuits, strawberry jam, oranges and chocolate. U – UMBRELLA: “You see we aren’t allowed to cook supper on the fire on weekdays. But Michael and I had put a small tin of Peasoup in front of the fire to heat — one hour before supper, which was quite within the law. When I came to take it off, the tin was bulging at both ends, hellish pressure inside owing to the steam of the boiling soup. I covered it with an umbrella and pierced it from behind — then took away the umbrella and stood at a safe distance; an enormous jet of steam and pea soup shot out, and continued to shoot for about 2 minutes — all over the study, the place was covered with condensing pea-soup” (from RD’s Even More Revolting Recipes). V – VEGETABLES: Dahl’s favorite thing to grow and eat. “For me, the prince of them all is the young broad bean. A plateful of those, lightly painted with melted butter and sprinkled with a little salt, eaten all alone on a warm plate before the main course is the ultimate joy” (from Memories with Food At Gipsy House by Felicity and Roald Dahl). W – WINE: Dahl began collecting wines in the late 1940’s and his cellar at Gipsy House contained about 4000 bottles kept at just the right temperature year round (55 degrees F). He became fascinated with wines after meeting his publisher Alfred Knopf, a famous gourmet and collector of fine wines. Bonus W: WINE GUMS: He loved these sweets and kept a jar of them at his bedside in case he got hungry at night. X – XMAS: “I loathe Christmas . . . the ritual of the turkey. It used always to be a goose (which tastes wonderful) or a plump capon, but some time ago someone decided that turkey was the thing to serve for Christmas dinner. Turkey breeders proliferated and millions of these birds were bred and fed in long sheds that kept their fluorescent lights on day and night to force the turkeys into gorging themselves round the clock. The breeders made a packet, as did the retailers, and soon virtually every family in Britain was stuffing itself at Christmas on one of the most tasteless meats that it is possible to find. I don’t know quite what is drier and more flavourless than a roast turkey. 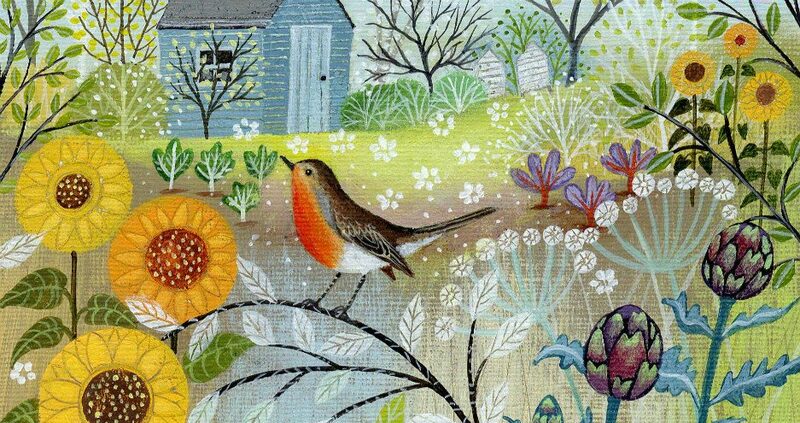 Its only virtue seems to be that one bird goes a long way — so long, in fact, that the family is usually eating it cold or hashed up for the next week” (from Memories with Food At Gipsy House). Z – ZULU BREAD: A yeast bread made with a combination of whole wheat and white flour and sunflower seeds. Dahl family friend Jinny Ash shared her recipe for Zulu Bread in Memories with Food at Gipsy House. 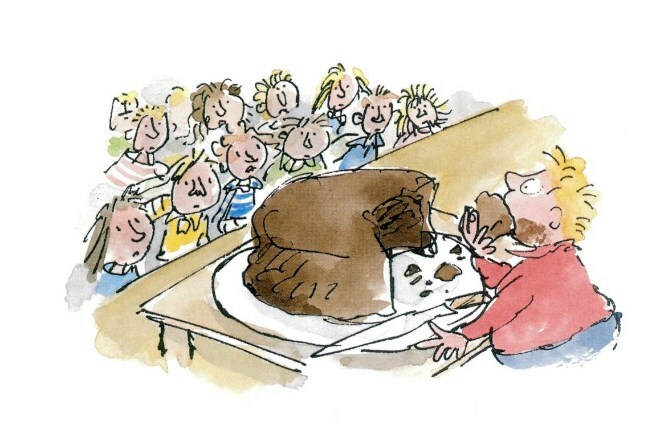 Roald Dahl’s Even More Revolting Recipes, illustrated by Quentin Blake (Viking, 2001). 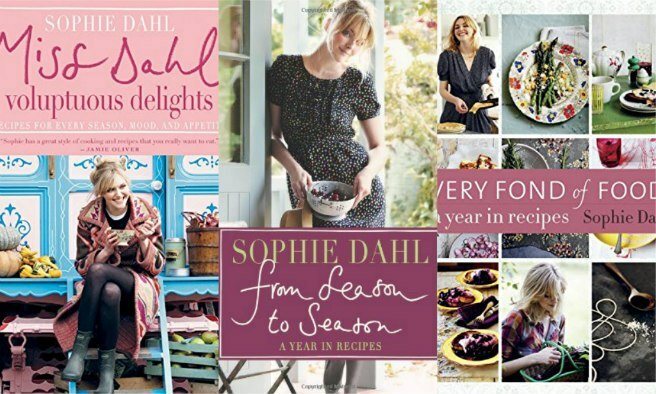 Since we previously made a “revolting recipe” as well as a soup from Memories with Food at Gipsy House, we thought we’d try one of Sophie Dahl’s recipes as a special 100th Birthday treat. You probably know Sophie (38) is Roald’s oldest grandchild, a former fashion model and an author in her own right who’s published two novels and several cookbooks. 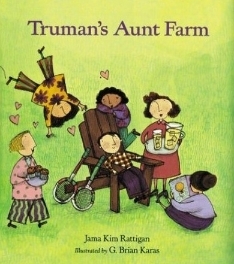 She also has the distinction of being the only person in Dahl’s family whose name was used for a human character. 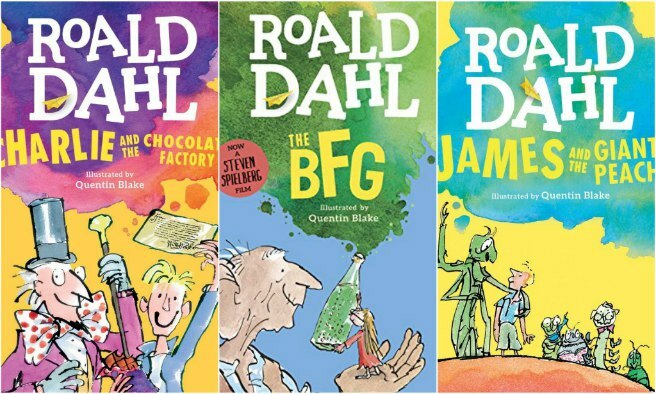 The BFG is one of my top 3 fave Dahl books and I enjoyed rereading it just for this post. I love the idea of collecting dreams in jars and blowing them into the rooms of sleeping children (Dahl sometimes did this with his own children). I love knowing that of all his books, Dahl was most proud of The BFG and considered it his classic. 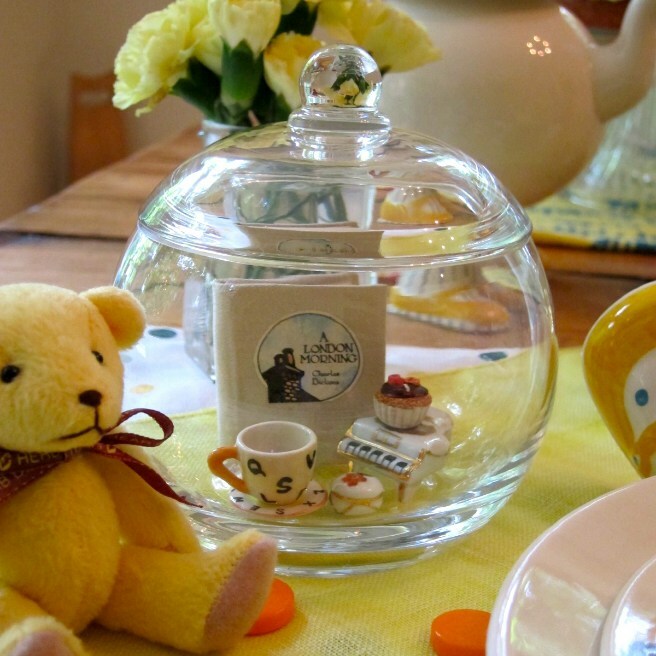 My favorite part of the story is when tiny Sophie and the Big Friendly Giant have breakfast with the Queen. The BFG scarfs down loads of bacon, sausages, fried potatoes and fried eggs (at least 70-something). While waiting for the hens to lay more eggs, he eats a whole sponge-cake in one bite. 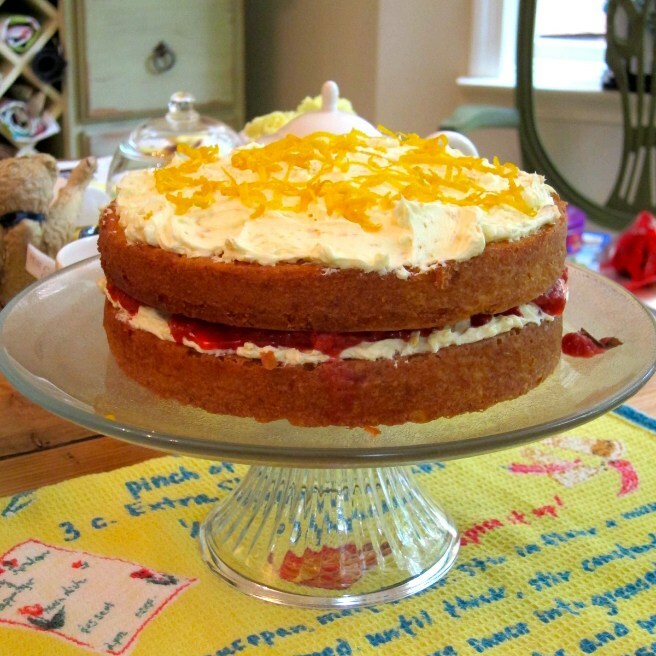 Just so happens the real Sophie featured a recipe for Orange Raspberry Victoria Sponge on her BBC-2 cooking series back in 2010. This classic tea-time treat, named after Queen Victoria, is also called a Victoria Sandwich, and is typically filled with raspberry jam and whipped cream, dusted over top with confectioner’s sugar. Sophie’s tricked out version calls for a buttercream icing made with fresh orange juice and orange rind, as well as a homemade raspberry jam filling. Overall, a suitably yellow dessert to commemorate a centennial. 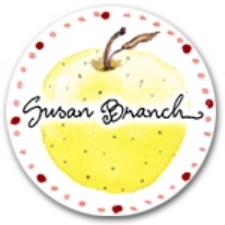 For the cake, grease and line two 8″ round cake pans with baking parchment, and dust with flour. In a food mixer, cream together the butter and sugar until pale and fluffy. Gradually beat in the eggs, then add the flour and orange zest and mix until well combined. Divide the mixture evenly between the two cake pans, then bake for 25-30 minutes, or until golden-brown and slightly springy to the touch. Remove from the oven and set aside to cool slightly in the pans before turning out onto a wire rack to cool completely. Meanwhile, for the jam, place the raspberries, orange juice and golden caster sugar into a small saucepan over a low heat. Cook for 15-20 minutes, or until the raspberries begin to break down. Remove the pan from the heat and set aside to cool completely. For the icing, beat the butter, icing sugar, orange juice and zest in a bowl until smooth. 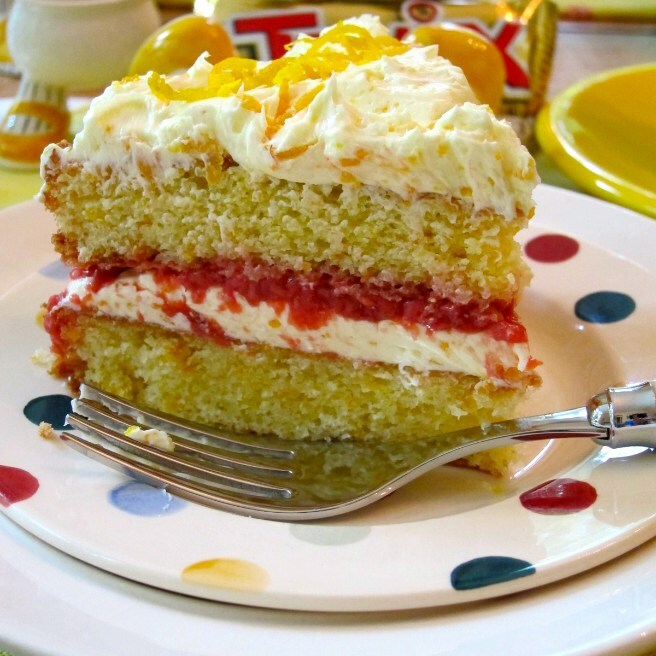 To serve, place one sponge on a serving plate or stand, and spread half of the icing on top. Spoon over the jam, top with the second sponge and finish with the remaining buttercream. Decorate with a little more orange zest if desired. This was my first attempt at a Victoria Sponge, and it came out a little denser than I expected. Next time I will add some baking powder to get more rise. I suggest being judicious with the amount of orange zest you add to the sponge batter and icing. I added the zest of a large navel orange to the batter, and found it a tad too cloying for my taste. For the icing, I cut the zest back to about 1/4 of the orange. The term “large” to describe an orange is relative; zest measured in tablespoons would have been more precise. I made the raspberry jam a day ahead and chilled it in the fridge to save time. It wasn’t a thick jam, so I strained off some of the liquid before spreading it on the sponge. I checked my sponges at 24 minutes and they were done. These are easy to overbake, so it’s better to err on the side of caution and check for doneness early on. Caster sugar is superfine sugar. You can make your own by grinding granulated sugar in a coffee grinder, blender or food processor. There is negligible difference in flavor between golden caster sugar and plain caster sugar. 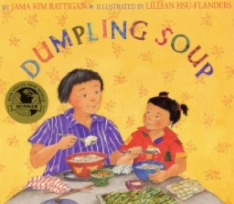 *Recipe adapted from “The Delicious Miss Dahl,” via the BBC., as published at Jama’s Alphabet Soup. 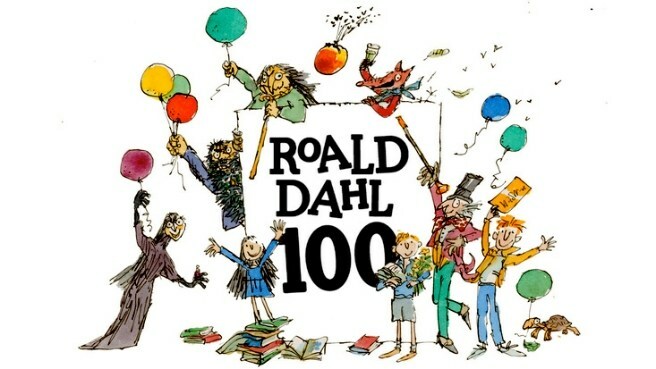 My top three favorite Roald Dahl children’s books. 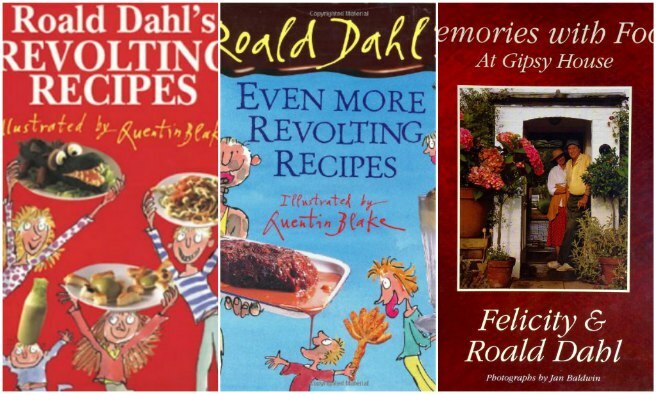 Roald and Felicity Dahl’s cookbooks. Just released September 1, 2016! Certified authentic alphabetica. Made by hand just for you with splendiferous words and whoppsy-good eats. 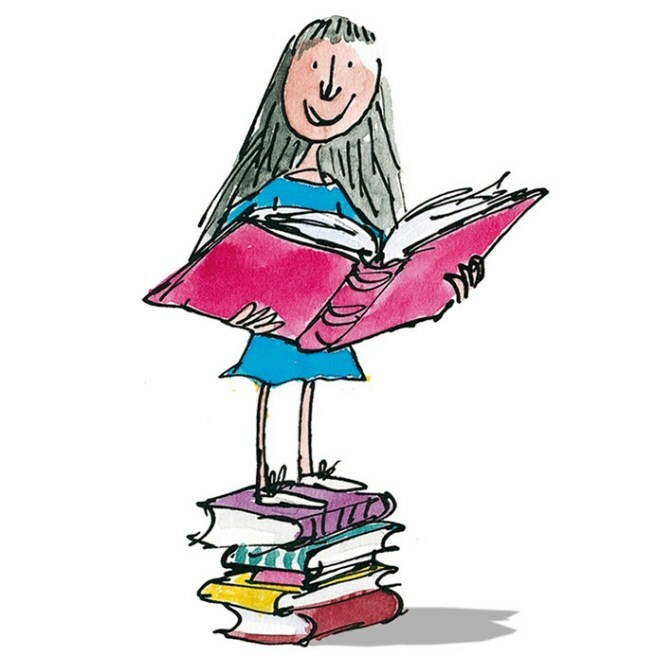 *Illustrations in this post copyright © Quentin Blake. What a whoopsy-splunkers tribute to the great storyteller! I loved learning more about him. Thanks Jama! Thanks, Iza. Have fun today but beware the humplecrimps! Wonderful! I love his language. We were talking like the BFG for days after watching the movie. Fabulous tribute, Jama! He did love gobblefunking with words. No one like him! Wow — that’s awesome. I’m trying to imagine Korean mixed with Dahl’s invented words. Yes, you should read his books in English too! One of the most glorious posts I’ve ever seen! Nose bags on! LOVED this post, Jama, from the fascinating alphabet (must make Nishnobblers! 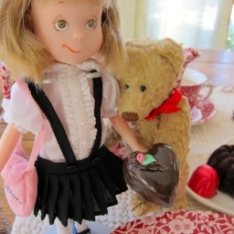 ), to Sophie calling him “Mold,” to the sponge cake recipe. 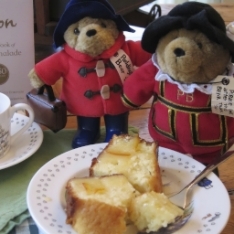 I adore sponge cake! Those nishnobblers look fun, don’t they? And we have a lot of bubble wrap around here. Will have to make some. Yay for sponge cake too! What an amazing post! Thanks, Jama. Glad you enjoyed it, Kate!! My favorite Roald Dahl book, hands down, is “Danny, the Champion of the World.” I mean, I love “Charlie and the Chocolate Factory,” of course, and the sequel is fun – Vermicious Knids! – but Danny is still my absolute favorite. 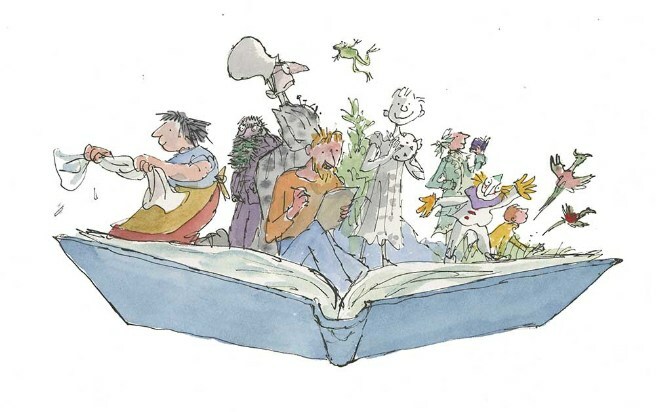 I have a small confession, though: I’m not attached to Quentin Blake’s art. 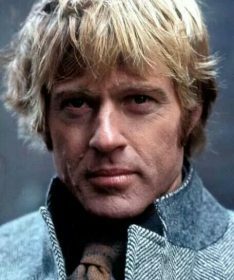 I mean, it’s fine, but I grew up with Joseph Schindelman’s art for “Charlie” (and “Glass Elevator”) and Jill Bennett for “Danny.” Those are the ones I bonded with, and anything else just feels off. My copy of Charlie contains Schindelman’s art so I understand what you’re saying. Blake’s illos were a later addition for me, too. I enjoy comparing the two, though. 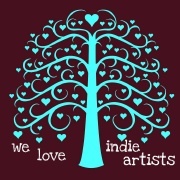 I don’t necessarily favor either artist. What an exhaustive (and exhausting, for the writer!) post, Jama – you’ve really outdone yourself! What a wealth of info here I never knew…thanks so much for putting this all together. And now I’m going to be saying “Nishnobbler” for the rest of the day, just because it’s fun! It was fun collecting all these bits and pieces. 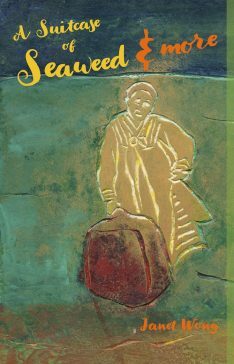 This past summer I read for the first time Boy and Going Solo and went from there. Naturally all the food-related tidbits caught my attention. 🙂 I think you should make your own nishnobblers. It’s basically melted chocolate painted over bubble wrap and then cut into circles after the chocolate has hardened. James and the Giant Peach is still my favorite. 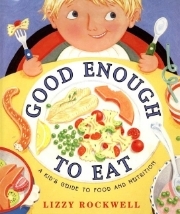 James was the first food-related book I wrote about when I started this blog back in 2007. It gave me a good “excuse” to make peach cobbler :). What a wonderful post, Jama! I love your alphabet. Nishnobblers! 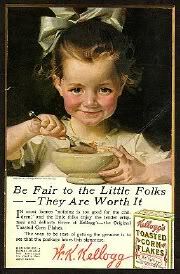 I just love the way it rolls off the tongue saying it, but I want to eat some too! 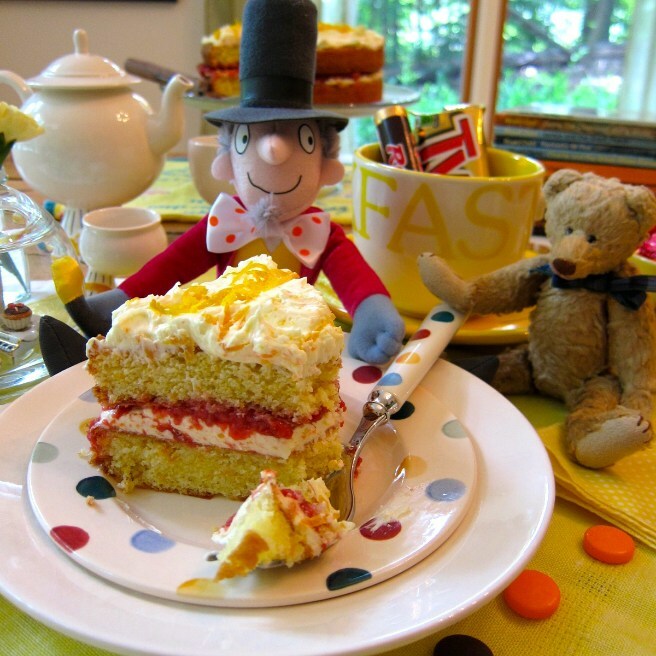 And the sponge cake looks divine…..
Beautiful, marvelous, fascinating! I remember that leg of lamb story. Didn’t know RD’s favorite color was yellow, though, and learned a lot of other things, too. Thank you! Another wonderful post, love all the pictures and information. Your alphabet and sponge cake both turned out amazing! Thanks, Marcia! Glad you enjoyed! So much more appreciation for this author thanks to you, Jama. Love the alphabet and now I know where this BFG film came from!!! I haven’t seen the movie yet. Did you like it? I read it was well received in the UK, but not so much in the U.S. Yes, you must use that phrase tomorrow. Wonder if they’re already familiar with it? Such a great post! I’ve eaten my share of Victoria sponges, but haven’t made one in a million years. I read Dahl’s GOING SOLO for my celebration post — It was the first I read of his adventures as an RAF pilot. Love, love, love this alphabet. But now I have to look up Wine Gums! I need to go out and read some Dahl, am ashamed to say how very little I’ve actually read. Loved Doc Spencer’s Pie, and the crocodile centerpiece was fabulous. He would have been a great father or grandfather, what a personality! Great celebratory post Jama. I think you’ll enjoy his adult short stories. Sounds like he was quite an unconventional father and grandfather. This is a slam nibble worthy wonderful post! 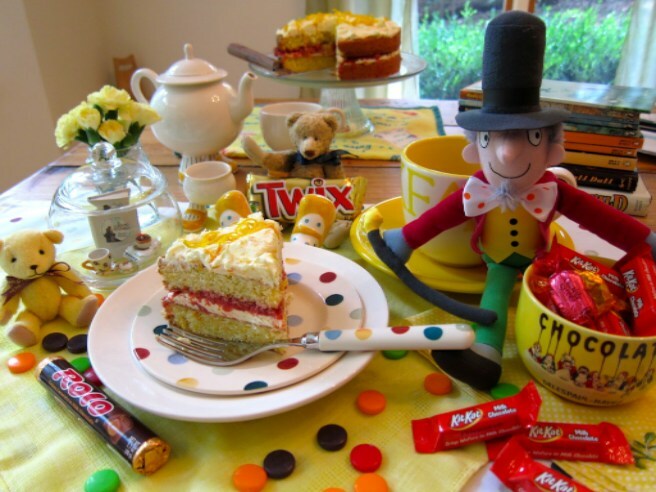 I love the sponge cake and reading more about an author we have read throughout childhood. Slam nibble worthy! Wow, thanks, Tina. 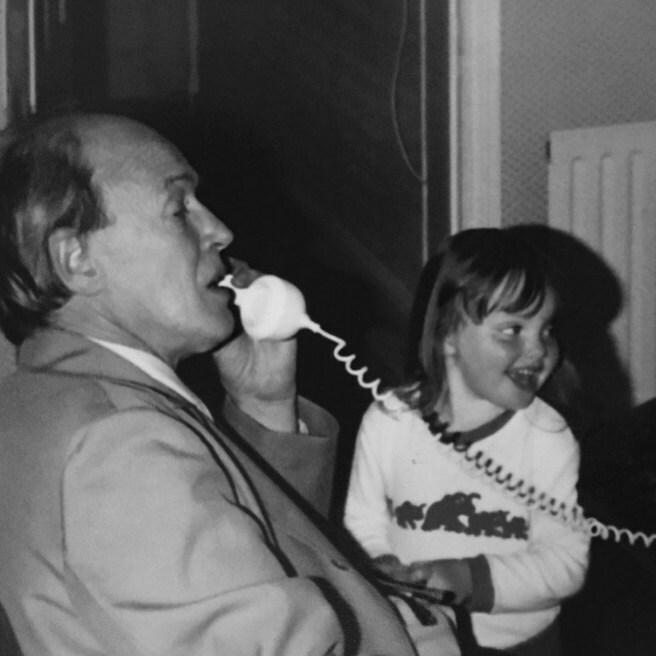 Never a dull moment with Roald Dahl! What a tribute! Love this post! 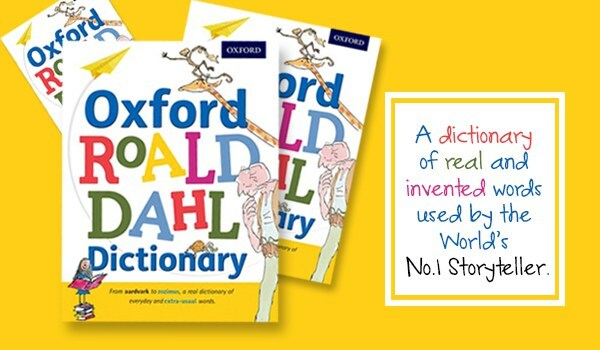 Dahl’s inventive wordplay is the BEST! Yes, I love his invented words, too. Thought I read somewhere this past week that the Oxford English Dictionary has just added six of his words to their dictionary in honor of his 100th. Quite something! Thank you, Carole. You have a good week too! It is always such a please to read your posts. Always so creative and so much fun!